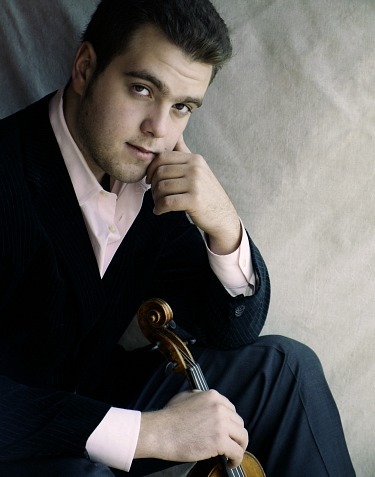 November 22, 2011, 12:45 PM · For violinist Mikhail Simonyan, it's all about the music now. We spoke with him last year, before he went, about his project called "Beethoven, Not Bullets," a fundraising effort to subsidize about 50 young music students in Afghanistan, through the Afghanistan National Institute of Music. So it's not surprising that Simonyan's new recording of the Khachaturian and Barber Violin Concertos, called Two Souls, is more a vehicle for exploring sides of his own musical soul than it is a means of displaying violinistic feats. Born in Novosibirsk, Russia, Simonyan started violin at the age of five. After coming to the United States in his teens, he studied with Victor Danchenko at Curtis Institute of Music, and he's made one other recording, of the Prokofiev Violin Sonatas , with pianist Alexei Podkorytov, released in January 2009. I spoke to Simonyan early this month, three hours before he was to perform the Khachaturian Violin Concerto with the Cincinnati Symphony Orchestra. Laurie: Who is conducting, then, tonight? Mikhail: My closest friend, Kristjan Järvi. Laurie: He is the conductor on your new CD -- and also the brother of Paavo Järvi, the former music director of the Cincinnati Symphony. How did you meet? Mikhail: I met Kristjan when I was 13 years old. He was at my first New York concert, at Lincoln Center. We started working when I was about 16; he had a youth orchestra in Sweden. Ever since then, we've been close friends. What's great is that we share the same musical ideas and we have a complete understanding of one another. I think it's very rare, in the classical music industry, that you come up with a duo between a conductor and a soloist. If you think about it, the reason why the Beatles and the Rolling Stones are good is because they always play together, over years! Laurie: In this recording, you took the last movement of the Barber a little slower, and I thought, wow, you can actually hear all the notes. Mikhail: Exactly! It only makes sense. Sometimes I feel that violinists are trying to stick to the marked tempo in that movement, but it never works because then it just becomes a complete mess when the orchestra comes in. Laurie: I've played that orchestra part, and putting it together can be a nightmare. Mikhail: The CD is designed to show the personalities and folklore of the music of both nations, Armenian and American. It has nothing to do with me showing how fast my fingers can move. Laurie: Though your fingers move pretty fast! Mikhail: (laughing) I don't need to emphasize on that subject! Laurie: Anyway it's sort of nice for somebody just to be making a musical argument for that last movement of the Barber. There's more rhythmic interplay, it seems like, at the slower tempo. Mikhail: Listen, I'm really happy that you are noticing this. Laurie: We spoke about a year ago, when you were about to do your New York Phil debut. You were playing your Christophe Landon violin. Is that what you used for this recording as well? Mikhail: That's exactly what I used. Laurie: It's a modern instrument, and it sounds really nice. What year was it made? Mikhail: This violin was made less than two years ago. Laurie: How did it wind up in your hands? So in my dressing room, before I was about to play the Khachaturian, I had a del del Gesù, Gagliano, Stradivarius, all these kinds of violins, and I said, 'I want to play on this violin.' After three days of existence as a fiddle, I played a concert on (the Christophe Landon violin). And I've stuck with it ever since. I'm also using the bow that Christophe made. Laurie: That is amazing. What does he sell his violins for, what is the range? Because certainly it's not $5 million. This violin adjusted itself, I didn't touch the sound post adjustment. It just works. Laurie: Back to your recording, I noticed that in the first movement of the Khachaturian, you are playing a new cadenza by Artur Avanesov, a Russian-born, Armenian composer who is about 30 years old. How did that come to be? Mikhail: Khachaturian was kind of in a hurry to finish this concerto, and the original cadenza he wrote is very showy and technical. It has nothing to do with the pure Armenian music that he's using in this concerto. David Oistrakh actually did the same thing as I did: he looked at that cadenza and said, 'I don't like it.' So he decided to write his own cadenza, which also has absolutely nothing to do with Armenian music. Of course with cadenzas, we're not really obligated to the composer -- if you go back to the time of Mozart and Haydn, cadenzas used to be something that people would just improvise on stage. So I decided to commission a new cadenza, and I asked this composer (Avanesov) to come up with sort of an authentic Armenian music. Armenian culture is super spiritual -- because Armenia is the first country that adopted Christianity. I think he did a beautiful job. Laurie: How did you know this composer? Did you already know him personally? Mikhail: I started asking for recommendations in Armenia for a young composer. I'm always trying to work with younger people … for a young composer to get a project like this, to release it in such a way, with such a great orchestra, it's a good opportunity. Laurie: If people really like this cadenza and want to play it themselves, will they be able to get the music for it? Mikhail: Absolutely. It's going to be published. Laurie: I have to say, watching you play the last movement of the Khachaturian, it looks so fun. Laurie: It's so quirky, rhythmically, it just is all over the place, and it looks fun for the orchestra, too. In the CD notes, there is a picture of the whole Järvi family, with Kristjan Järvi practically sitting on Khachaturian's lap, as a child. Did he have a lot to say about this concerto when you were putting it together? Mikhail: Absolutely. His father, Maestro (Neeme) Järvi, was very close with the composer. But what Kristjan said, most importantly, was that every composer just wants his music to be very successful. Sometimes I think that nowadays people are way too worried about what's written in the score. I don't want you to think that I'm not serious about what's written in the score, but sometimes I have a feeling that the composer wrote a piano at that particular moment, then maybe 10 years later he didn't want to have a piano there. You listen to your recordings that you made 12 or 13 years ago, and you maybe do it completely differently now. Laurie: What is your history with the Khachaturian, when did you first play it? Mikhail: I played it when I was about 16. Laurie: What do you think is different about what you are doing now with it than what you were doing then? Mikhail: I'm playing it in a much more folkloric way. I used to play this concerto very violinistically. I was very worried about all these passages, and about showing, look how big my sound is on my G string -- but now I'm going completely into the folklore of this country. Mikhail: Look, once you learn it, you learn it. You don't have to worry about it, you don't need to concentrate on how you're going to play this passage or not. Look at all these folkloric musicians, all these folkloric bands -- they don't spend their time practicing the passages. When they improvise, they just do it naturally. Laurie: Last year, we talked about how you were about to go to Afghanistan to help with some new music education efforts. How did that go? Mikhail: It was great, I loved it. I loved the students, and I loved the fact that people in those countries haven't lost the purity and sincerity of expressing emotions. They say thank you, and they mean it from the bottom of their hearts. Laurie: What was the moment when you realized you were making a difference? Mikhail: It was not really me who was making a difference. It's the whole thing together that's making the difference. There's still a long way to go until that country is going to (have music) like the west. The kids, they haven't seen anything except war and tragedy, but when they're making music, they love it so much. When I got back, I was a completely different person. We hear our colleagues complaining about the fact that they don't get paid more than $175,000 a year by playing the instrument. These guys, they love the music, and for them, music is such a pure thing and it changes their lives. Laurie: How is the Afghanistan National Institute of Music doing at this point? Mikhail: It's doing well. We're getting a lot of donations and new teachers, and hopefully I'll get a chance to go there again at the end of the year. Mikhail Simonyan plays the last movement of Khachaturian's Violin Concerto with Kristjan Järvi andthe London Symphony Orchestra, recorded for the albm Two souls. November 28, 2011 at 07:47 PM · I admire his interpretation of the Khatchaturian violin concerto.........he plays it as he mentions in your interview, with an Armenian touch and pure and simple expression coming all natural. Great work Mikhael Simonian.